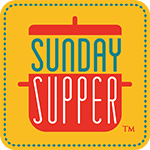 We take turns hosting each month and choosing the theme/ingredient. This month I'm hosting and have chosen breads from around the world that are traditional for Easter, Passover, or Springtime. 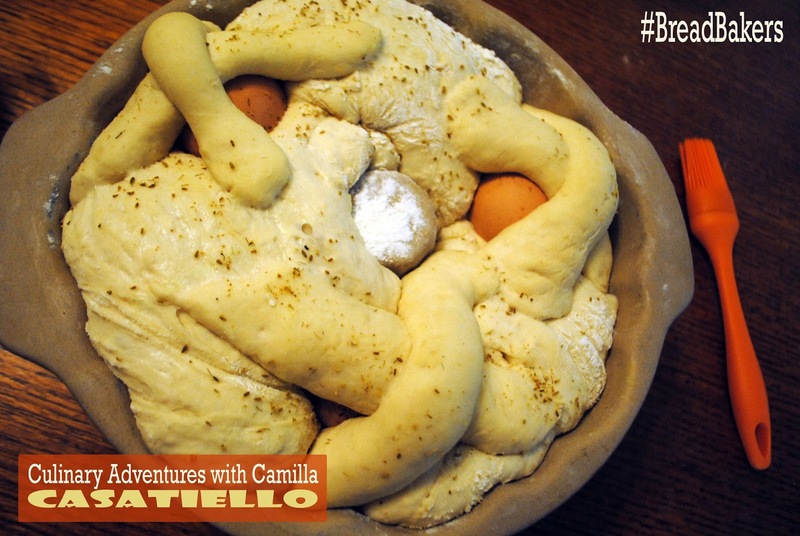 Casatiello is a traditional Easter bread from Naples and it holds all of the symbolism of faith. The leavened dough, because of the rise, represents the promise of new life; the shape of the bread represents Jesus' crown; and the eggs mean birth, or rebirth. There are probably as many variations of this as there are Nonne who bake them. My version includes something that I consider culinary fairy dust: fennel pollen. I sprinkled it over the top and selected a salami that has fennel pollen as well. Che squisito! Place the warm water in a large mixing bowl. Float the yeast and sugar on the top and let bloom until foamy, approximately 10 minutes. Pour in the olive oil and add the cheese. Mix in the flour until a shaggy dough forms. Cover with a dish towel and let rise in a warm palce for 90 minutes, or until it doubles in size. Punch down the dough and tear off a large orange-sized piece. Set aside. Butter a bundt dish and preheat the oven to 375 degrees F.
Knead the remaining dough and - on a floured piece of parchment paper - roll dough out into a large rectangle. 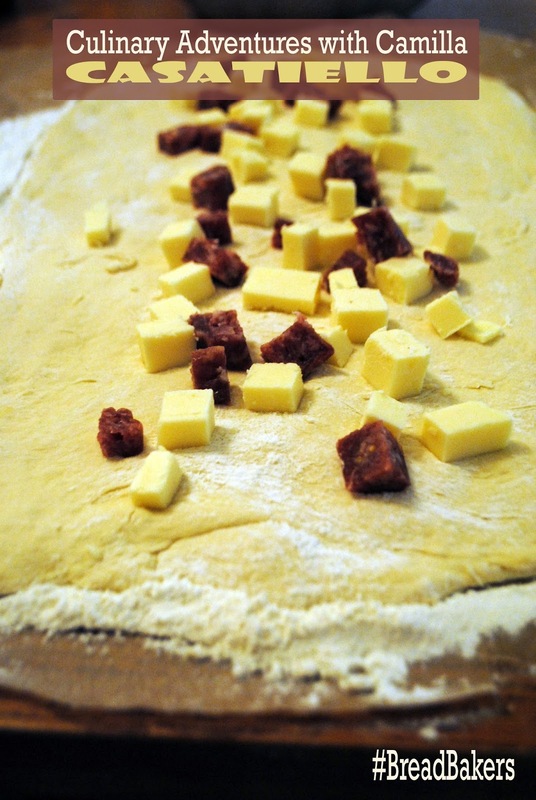 Scatter the cheese and salami over the surface, leaving about an inch border around the filling. Sprinkle with salt and pepper. Starting at the longest side, gently roll the dough into a cylinder and transfer into the prepared bundt pan. Place eggs randomly on the top of the dough, pressing them in to anchor them. Split the saved piece of dough into 6 equal pieces and roll each piece into a 3" strip. Use two pieces to form a cross over each egg. Allow to rise for an 1 hour. Beat the remaining egg with a fork and brush it over the surface of the dough. Bake until golden brown, approximately 45 minutes. Let cool for 5 minutes then unmold onto a wire rack. Serve warm, sliced into wedges. *After a few people have commented that they are unfamiliar with fennel pollen, I decided to add a link to the product that I use and love! This is an affiliate link. Oh my at all the tasty filling for that bread. I need to bake it before Easter next year. Renee, why wait till Easter!? I'm thinking it's a great picnic bread. I thought it would be hard to make. You took all the guess work out of this bread. It was fairly easy. You should try it. You'll like it! 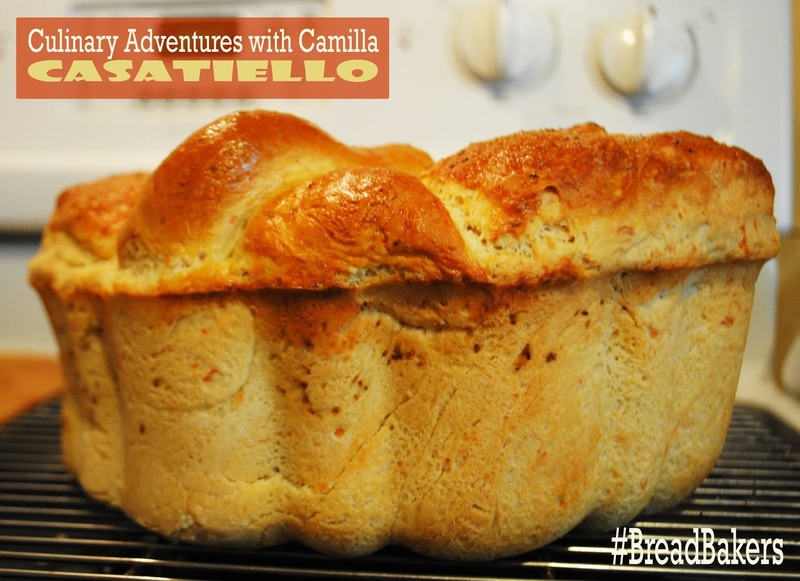 This would be my ideal Easter bread, Camilla. Salami and cheeeeeeese! And now I need to hunt down some fennel pollen because it sounds like fun. Thank you so much for hosting this great theme! Thanks! Yes, salami and cheese are wonderful...and there's no need to wait till next Easter!! It was delicious, Wendy. 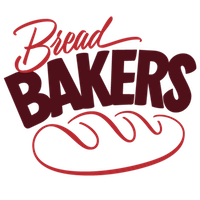 Thanks for joining in with Bacci's bread. I love fennel pollen. I agree with you, it is the culinary fairy dust. Thanks for a great theme! Oh wow! I love this savory bread--sausage and Parmesan and fennel pollen? Yes please! What a great theme, Camilla. Thank you so much for hosting this month! Thanks, Jenni. Can't wait for next month's theme. I LOVE bread...probably more than I should. I feel like given how much I love fennel I would have heard of fennel pollen, but no! Thanks for introducing me to it, I'll look forward to trying it out! You're welcome. I added a link to fennel pollen at the bottom of the post since a few commenters were unfamiliar. It's magic! Fennel pollen! Like fairy dust! 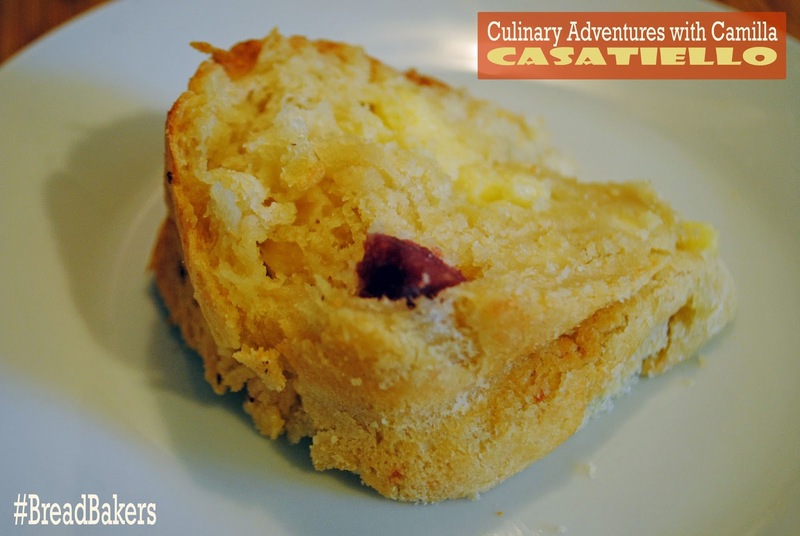 I do love this bread and can't wait to try yours. Love the flavor of Fennel... Never before heard of fennel pollen... time to explore.... Thanx for a wonderful theme. Great explanation of your Easter bread! It looks delicious, thanks for hosting! Thanks, Cindy. I love Easter - and Easter bread - and thought it would be nice to see other people's traditions, too. Cheese and olive! I didn't see that one when I went surfing. Your bread came out very nice and I am sure it was an Easter favorite! Thank you for the link for the fennel pollen. Cheese and olive? Now you have me thinking. I think I might like that even better than the cheese and salami I used. Me, too. I almost always gravitate towards savory! Thanks for paying along. I hope you had fun. Anything with cheese and salami and I'm so there. This looks absolutely delicious. 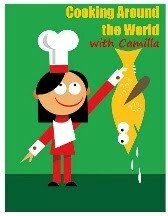 Thanks for hosting, Camilla. I'm discovering so many wonderful breads. Me, too. I have lots of baking to do! Oh I so love savoury breads! This looks awesome! Must try soon! I really like the meaning behind this bread with it being the crown and the eggs being rebirth...very cool. That is such an amazing savory bread. Cheese in the dough and the filling sounds absolutely delicious. Fennel pollen is new to me too so thanks for sharing the link. I love this bread - it's like an entire meal. I will have to make a version of it soon.